Welcome to the Shawnee cabin, Estes Valley Operating Permit #6031 -a licensed vacation rental property. 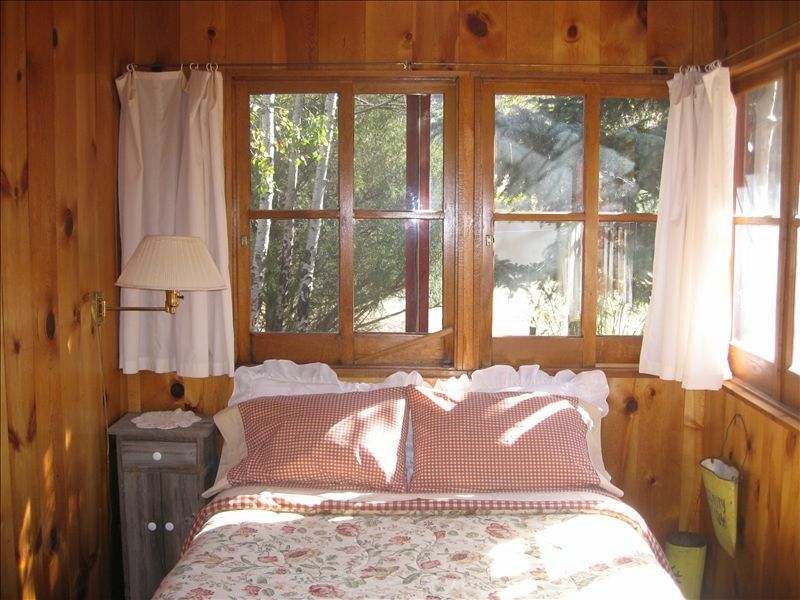 Come and relax at this historic vintage 1928 cabin built on what was once Ferguson Ranch. With views and rock outcroppings all around, this cabin is located one mile west of downtown Estes Park and approximately 2 miles east of Rocky Mountain National Park. This non-smoking log cabin has an original warm knotty pine interior with a wood burning fireplace and lots of character. Enjoy a good night's sleep on our quality mattresses in the two bedrooms, each with a dresser and closet. The kitchen with original Douglas fir floors is inviting, filled with natural light, and great for enjoying the many mule deer and elk that often wander through the area, as well as the birds that come to our feeders. Cabinets are thoroughly stocked for your convenience. The bathroom has a large shower. We also have a picnic table and propane grill in the back yard. The south-facing deck with views of Prospect Mountain is a perfect spot to relax with a cup of your favorite beverage. Here is the perfect place to experience the true feeling of Colorado in your home away from home, to enjoy the beauty and tranquility of the Rocky Mountains. America's favorite towns--#2 Travel & Leisure's 2013 , -Elk wander the streets at will in this gateway town to Rocky Mountain National Park, where a bustling Main Street encourages visitors to stroll with ice cream cone in hand. We require a 50% deposit to secure your reservation & a signed rental agreement. Final payment and $300 refundable damage deposit is due 15 days prior to your arrival. Check-in is after 4:00 p.m. Check-out is 9:00 to 10:00 a.m.
We do not rent to vacationing students or singles under age 23 unless accompanied by an adult guardian or parent. You may be asked to provide proof of age. NOTE: If less than the minimum nights (3 in peak season) are available between other bookings we can usually reserve two nights for you if you send us an inquiry. We love going to Estes Park to kick back, relax, read by the fireplace, watch the deer and elk and hike or snowshoe in the mountains. This cabin fit our ideal image of a cozy place to relax in. Estes Park is a wonderful, quaint, picturesque town with lots of outdoorsy things to do. We love this knotty pine cabin. This is the epitome of what a mountain cabin should be.